A new package of measures to ensure rapid initiation of antiretroviral treatment and diagnosis of opportunistic infections has been recommended by the World Health Organization (WHO) to reduce the still high rates of death in people diagnosed with HIV at a very advanced stage of disease. Treatment that can prevent the development of disease is not being used to full advantage, despite a series of WHO recommendations over the past few years. In particular, the implementation of isoniazid preventive therapy to prevent TB is still patchy and rapid diagnosis of TB also needs to be scaled up to save lives. WHO says that people have advanced HIV disease if they have a CD4 cell count below 200 cells/mm3, or symptomatic HIV disease (WHO stages 3 or 4). People in these categories have a very high risk of further disease progression or death and are in urgent need of treatment. All children with HIV below the age of five are considered to have advanced HIV disease. Although 'test and treat' treatment guidelines have led to a reduction in the proportion of people who start treatment at very low CD4 cell counts from close to two-thirds in 2010 to around one-third in 2015, the overall number of people who are starting treatment at low CD4 counts remains high due to the overall increase in the volume of people beginning treatment. People are also presenting for treatment with very advanced HIV disease after having been lost from care or treatment previously, said Dr Eric Goemaere of Medécins san Frontières (MSF). A majority of people presenting late for treatment in South Africa are probably people who have fallen out of treatment, not treatment-naive patients, he told a WHO symposium held in Paris to coincide with the 9th International AIDS Society Conference on HIV Science (IAS 2017). What’s more, MSF has found that around three-quarters of all hospital admissions at its clinics providing HIV care are of advanced HIV patients who have been receiving antiretroviral treatment for some time, suggesting that signs of virological, immunological or clinical deterioration have been missed. People presenting with advanced disease are at high risk of death even after starting antiretroviral treatment because they usually arrive at health care facilities with opportunistic infections. The Reality study of preventive treatment for people with advanced HIV infection found that deaths peaked in the first three weeks of the study, especially among people not receiving the enhanced package of preventive treatment tested in the study. Among people with advanced HIV disease, tuberculosis (TB) remains the biggest killer, accounting for around a quarter of all deaths, said Nathan Ford of WHO. Cryptococcal meningitis, bacterial infections and pneumocystis pneumonia account for more than half of the remaining deaths. To address these risks, WHO is now recommending a package of tests and interventions designed to ensure rapid treatment of HIV infection and opportunistic infections. WHO also recommends that people with advanced disease should start antiretroviral treatment immediately unless they have TB or cryptococcal meningitis, in which case they should start treatment as soon as it is safe to do so. Short-term worsening of symptoms – the immune reconstitution inflammatory syndrome (IRIS) – may accompany a rise in CD4 cell count after starting treatment so it is important to begin to bring these diseases under control before beginning antiretroviral therapy. CD4 cell count testing: the guidelines say that CD4 cell counts at diagnosis remain essential for identifying high-risk patients who need further diagnostic tests. TB testing: anyone with clinical symptoms of TB should receive a sputum Xpert TB test as the first screening test; urinary TB-LAM rapid testing may also be used in people with CD4 counts below 100 or anyone who is seriously ill.
Cryptococcal antigen testing for people with CD4 cell counts below 100 cells/mm3. Isoniazid preventive therapy for everyone without active TB. Fluconazole pre-emptive therapy for anyone with CD4 counts below 100, no active disease but positive for cryptococcal antigen. Cotrimoxazole prophylaxis against bacterial infections and toxoplasmosis for everyone with symptomatic HIV disease, or with CD4 cell counts below 350 cells/ mm3 or at any CD4 count in settings with a high burden of malaria. Start antiretroviral treatment immediately BUT defer if clinical symptoms suggest cryptococcal meningitis or tuberculosis. People with CD4 cell counts below 50 cells/mm3 should start antiretroviral treatment within two weeks of starting TB treatment and within eight weeks of starting antiretroviral therapy in all other cases. View the details of this session and download slides where available on the conference website. 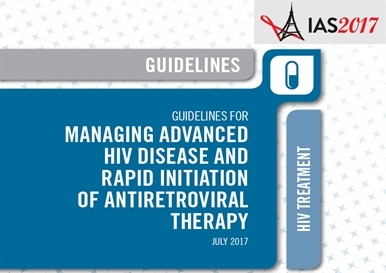 Download the Guidelines for the managing advanced HIV disease and rapid initiation of antiretroviral therapy from the WHO website.